A dark, contemporary fairy tale in the tradition of Neil Gaiman. Jeremy Johnson Johnson hears voices. Or, specifically, one voice: the ghost of Jacob Grimm, one half of The Brothers Grimm. Jacob watches over Jeremy, protecting him from an unknown dark evil whispered about in the space between this world and the next. But Jacob can't protect Jeremy from everything. When coltish, copper-haired Ginger Boultinghouse takes a bite of a cake so delicious it’s rumored to be bewitched, she falls in love with the first person she sees: Jeremy. In any other place, this would be a turn for the better for Jeremy, but not in Never Better, where the Finder of Occasions—whose identity and evil intentions nobody knows—is watching and waiting, waiting and watching. . . And as anyone familiar with the Brothers Grimm know, not all fairy tales have happy endings. Veteran writer Tom McNeal has crafted a young adult novel at once grim(m) and hopeful, full of twists, and perfect for fans of contemporary fairy tales like Neil Gaiman's The Graveyard Book and Holly Black's Doll Bones. 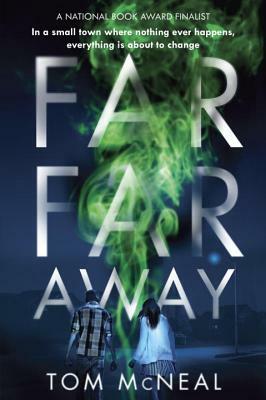 The recipient of five starred reviews, Publishers Weekly called Far Far Away "inventive and deeply poignant." TOM MCNEAL holds an MA in creative writing from UC Irvine and was a Stegner Fellow and Jones Lecturer at Stanford University. He is the author, with his wife, Laura, of four young adult novels published by Knopf: Crooked, Crushed, The Decoding of Lana Morris, and Zipped. His adult titles include Goodbye, Nebraska and To Be Sung Underwater. He lives with his wife and two sons in Southern California. Visit their website at McNealBooks.com. "McNeal weaves in fantastical fairy-tale details into this inventive and deeply poignant narrative, creating a world that hovers between realism and enchantment." "Whether readers connect more deeply with the suspense, the magical elements, or the gloriously improbable love story, they will come away with a lingering taste of enchantment." "Reminiscent of Hansel and Gretel, and rife with allusions to Grimm Brothers’ tales, this is a masterful story of outcasts, the power of faith, and the triumph of good over evil." "Stunning. [A] beguiling, horrifying and gracefully written novel."